There is an obvious fact that every brand, every region has a different size regulation. Thanks to Mageplaza Size Chart Extension, it makes it easy for administrators to display the size chart for each product on the frontend. From there, customers can quickly determine the size to suit themselves, avoid the case of product return. 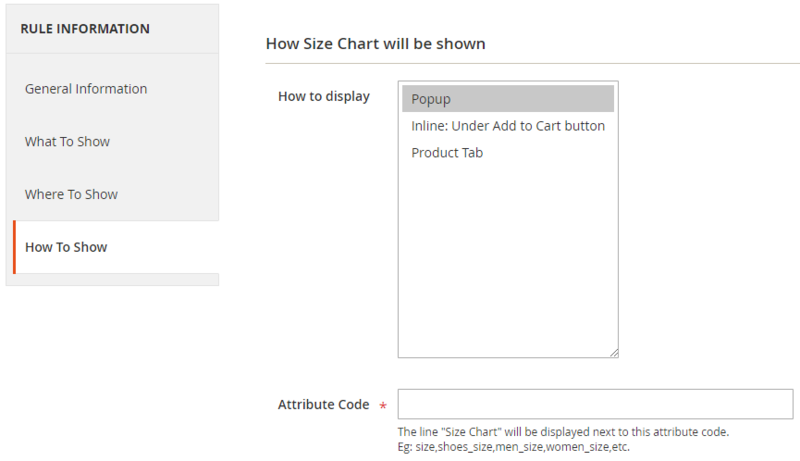 Size Chart will be displayed as a popup or inline or in the Product tab according to the choice of the Admin. With intuitive HTML customization, admins can edit charts become user-friendly, boosting sale revenues effectively. This field allows admins to stipulate the Size Chart display according to each of certain rule. 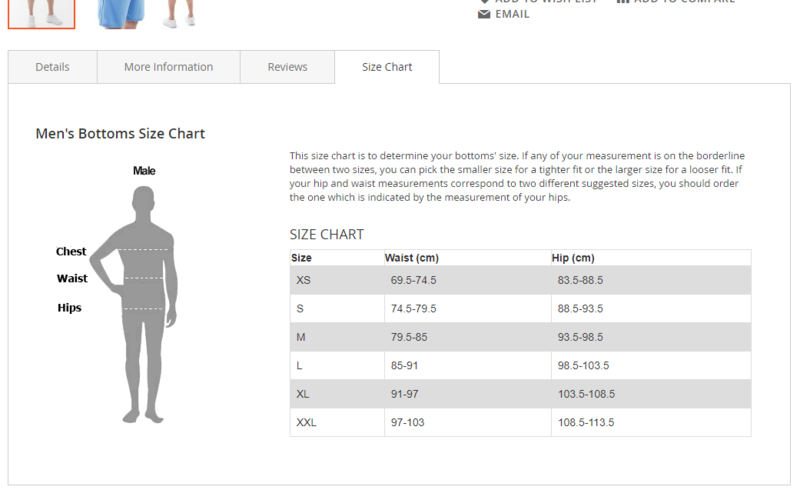 This is a place where stores all Size Chart created. From the Grid, admins can capture the basic information of the rule as ID, Name, Display Type, Priority, Create Date, Update Date, Active, and Action. Delete: Admins need to choose the Size Chart Rule that they want to delete, then choose Delete in the Action box (in the left corner of the Grid) to remove. A confirmation dialog will be displayed, you choose OK to continue deleting. Change Status: Admins need to choose the Size Chart Rule that they want to change the status, then choose Change Status > Enable/Disable in the Action box (in the left corner of the Grid) to change the status. Immediately, selected Size Chart rules will return to the selected status. Edit: To edit a rule, admins choose Edit in the Action box (the last column on the right of the Grid). 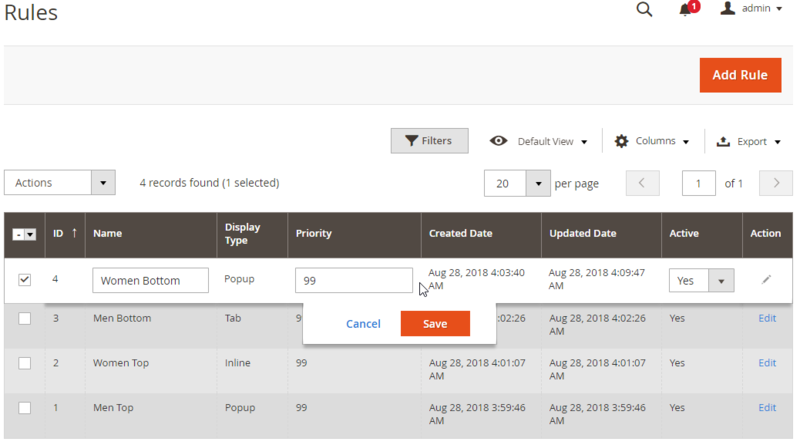 Also, admins can filter, change store view, hide or appear the columns or Export Grid. After logging into the Manage Rules page, admins choose Add Rule to create a new template. After you Save and Continue Edit, the page will be auto-returned to the Edit Rule page. Set the name for the rule. This name only displays in the backend to distinguish between the different rules. Active: Choose Yes so that the rule can work well. However, the product can apply it or not, this will depend on the condition, store view, and the priority. Store view: This is Store View that Size Chart rule will be applied. A website can have multiple store views. 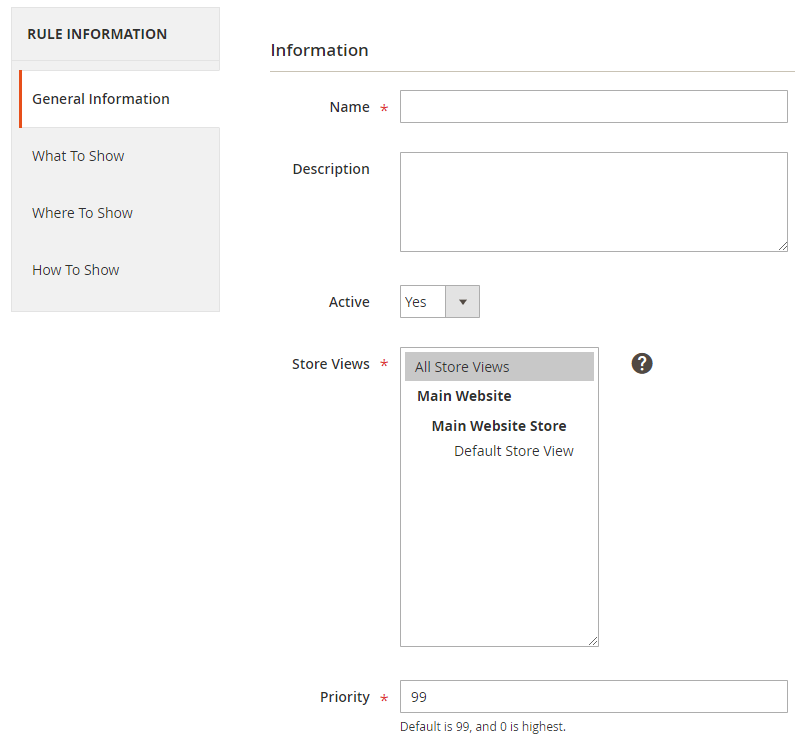 When admins choose Store View in this item, Size Chart rule will be applied in that Store View. Template HTML: With this customizable HTML, it is easy for you to design your desired template with the HTML command line. Template CSS: You can add CSS in this field so that your template becomes beautifully. Demo Template: We have available 6 templates for your reference. After choosing the desired template, please click on Load Template so that the content of the template is displayed in Template HTML and Template CSS field. This is a place that you select the conditions for the rule. The new rule will be applied when these products can satisfy the selected conditions. You can change the status True/False of the condition by clicking on the bold text. 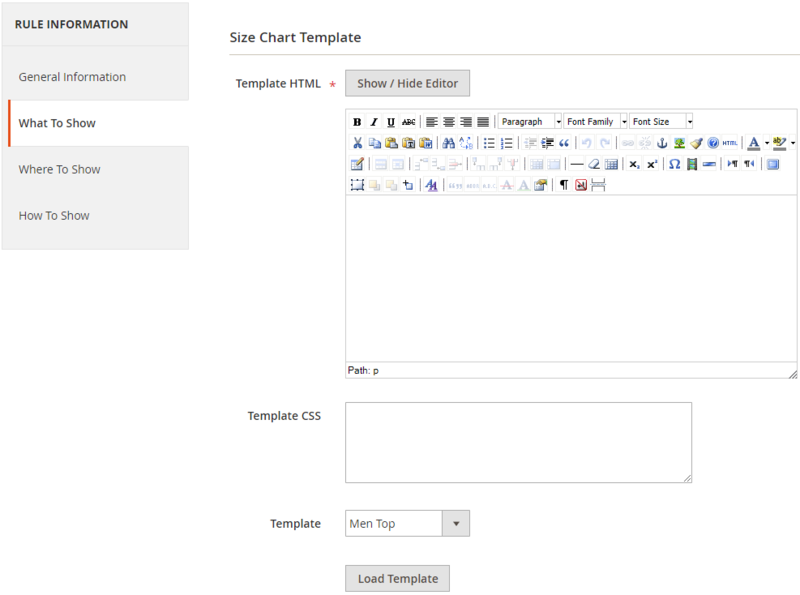 How to display: We offer 3 ways for you to show Size Chart in the frontend. You can allow displaying many positions at the same time, however, at the same position shows 1 size chart only. Popup: Size Chart will display as the popup when you click on the Size Chart button. The position of the popup button depends on the attribute you enter in the Attribute Code field. This button will display when the Attribute Code is entered as a swatch/dropdown attribute. Inline:Under Add to Cart button: Size Chart is displayed on the frontend under the Social Link button. Product Tab: Size Chart is displayed as a tab in the Product information block. You need to fill in the attribute code of the Swatch/dropdown attribute to display the popup button just after that attribute. 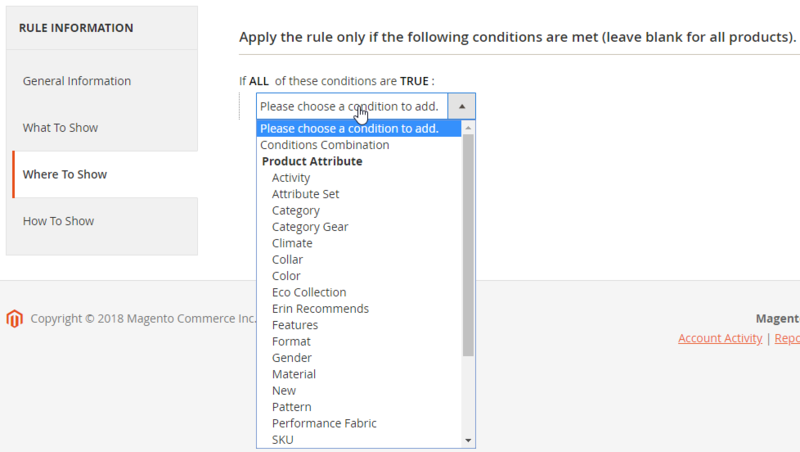 To know the attribute code of swatch/dropdown attribute, you can go to the stores from the admin panel, choose Attribute > Product. Choose Icon for Size Chart popup so that it can display on the frontend. Example: Product A belongs to two categories which are Women and Jackets. To set all products in the category by one certain Size Chart Rule, admins can select Catalog > Categories, and set the attribute Size Chart similar to when setting Size Chart in Edit Product. If you select Size Chart = Inherit from Rule, the selected products (Inherit from Rule in the Edit Product) in the Category will be applied the rule with the satisfied condition and the highest (smallest) Priority. Inline:Under Add to Cart button: Size Chart is displayed in the frontend under the Social Link button.